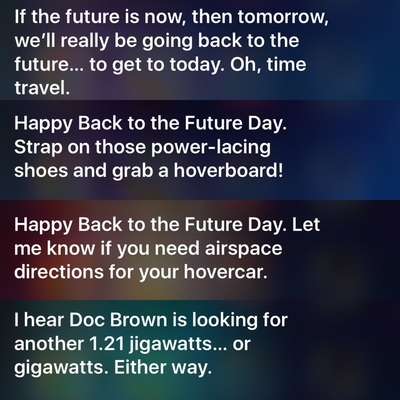 Today marks the day Marty McFly and Doc land in the future in the hit movie "Back to the Future Part II", and Siri is celebrating by the only way she knows: handing out witty and smart responses to a certain statement. 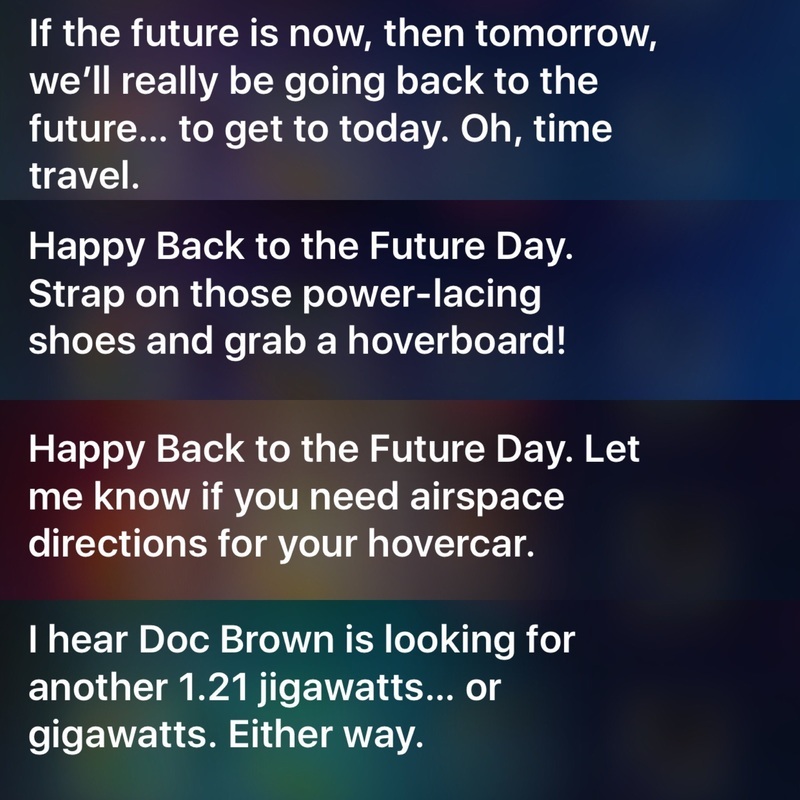 Unless you live on another planet or live in the middle of the ocean, you probably know that today is officially Back to the Future Day, a day geeks (along with movie fans) have been waiting for for almost 30 years. Back in 1985, the first Back to the Future movie was created, with Michael J. Fox and Christopher Lloyed as the stars of the film, playing Marty McFly, a young student and "Doc", a crazy scientist who creates a time machine out of a DeLorean, respectively. After the major success of the film, Universal Pictures decided to make another one four years later, with a third movie coming a year later. The second film was titled "Back to the Future Part II" as a continuation to the first movie, also based in 1985. The reason I bring up this particular film is because in the film, when Marty and his girlfriend are in the DeLorean/time machine, Doc takes them to October 21, 2015, 30 years into the future, which, if you look at your calendar, is today's date. Pretty cool, right? Of course, back in the 1980s, we had a different picture of what the future would be like. Apparently, we thought that we'd have hover boards, self-tying laces on our shoes, flying cars, and "Pepsi Perfect". Unfortunately, we don't have any of that stuff just yet (or we'll just never have it), but we do have video games you control with gestures, 3D movies, tablet computers, and fingerprint readers. So at least they got some stuff right. Everyone is saluting this day in their own manner, like rides in a B2TF DeLorean look-alike, "Pepsi Perfect" bottles for sale, exclusive movie theater showings of all three films, and plenty of parodies of the hit movie. So this may get you wondering, "What is Apple doing to celebrate?" First of all, they are. 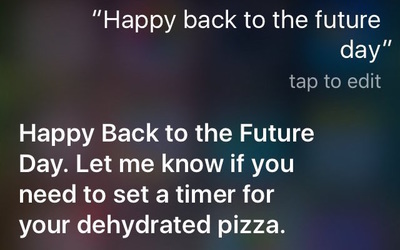 And second, they're using Siri to do so. 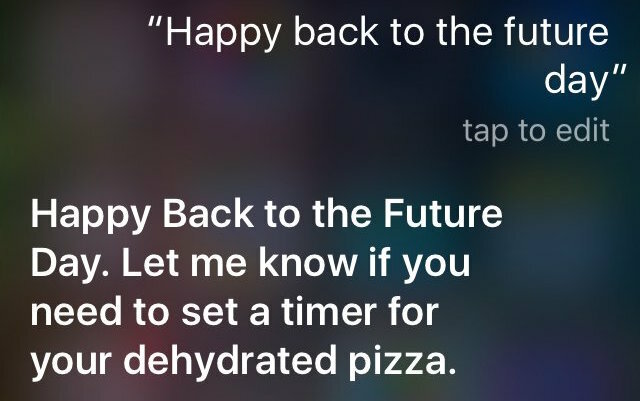 This is Apple's favorite way to celebrate important days like this. And users love it!